See and talk to the Artist on Sunday Feb 10th between 2pm and 4pm. A native New Mexican born and raised in Roswell, Dianne has studied Art since she was in elementary school. She attended Mississippi Women’s University and is a graduate of Southwest School of Art. 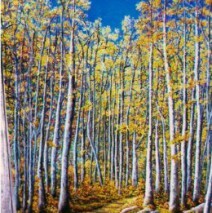 Dianne’s oil and acrylic paintings have been exhibited in numerous fairs, galleries and shows in New Mexico and Texas, the New Mexico State Capital and are in many private art collections. She has lived in Santa Fe since 1985 and is a state government retiree. Dianne was honored by placing second in a 2008 juried show of the National Society of the Daughters of the American Revolution, and she has participated in exhibits of the New Mexico Society of Dar. the gentleman jumped over near the end.